Six-time Paralympic champion David Weir and his long-term coach Jenny Archer have launched a new academy to help unearth future Paralympic medallists. The Weir Archer Academy will be based at the Kingsmeadow Athletics Stadium in Surrey, focusing on athletes from all Paralympic disciplines in south London. They will also run training camps for UK youngsters and coaches. “I want this to be my legacy so that London  is not just a one-off,” Weir told BBC Sport. “There are literally thousands of potential athletes out there who are just waiting to be discovered and I want to help with that. Archer, who worked as a fitness coach for Wimbledon FC for a decade from the late 1980s, added; “It’s something we’ve been talking about for the last two or three years and we really want to be able to give young kids the chance to try out the sport. The academy will be run as a charity so that athletes – many of whom who do not yet qualify for UK Sport funding – can attain financial support through commercial partners. Those backers will also help cover the costs of training equipment, staffing, the redevelopment of the Kingsmeadow Stadium and transport for athletes and coaches who are based elsewhere in the country but make ad hoc appearances at the club. Although all talented athletes regardless of their disability will be targeted, Weir admits he is keen to ensure a new generation of wheelchair racers are ready to come forward once he retires from the sport. 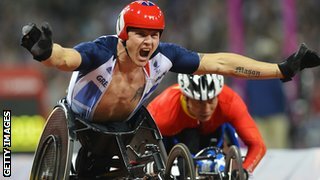 “We’ve done so well and had some great stars in this country with Tanni Grey Thompson, Shelley Woods, Micky Bushell and myself and I want to see the country staying strong with a new generation coming through,” explained the man dubbed the “Weirwolf”Â after winning four gold medals at last year’s Paralympics. Weir, 33, is aiming to attend two sessions per week either coaching or mentoring young athletes, but he is far from finished with his own career. The wheelchair racer will be bidding for a record-breaking seventh London Marathon title later this month before switching his attention to a possibleÂ Commonwealth Games debut competing for England in 2014. “It gives me inspiration and I know I give them a lot of inspiration as well,” said Weir. The Weir Archer Academy already has 25 athletes signed up, including 18-year-old London Paralympian Jamie Carter – who is based three and a half hours away in Lincolnshire, and travels down once a month to receive expert tuition from his idol. “There is a good atmosphere and there are big hopes for the academy so it is good to be a part of it,” said Carter, who hopes to have his travel costs covered through the new academy set-up. UK Athletics has its own programmes for recruiting youngsters and developing emerging talent, but Paralympic athletics head coach Paula Dunn believes the Weir Archer Academy will aid rather than conflict with existing initiatives. “It’s going to be brilliant for the sport and we as a governing body love anyone who creates these opportunities,” Dunn told BBC Sport. “It takes the load off us and it means that athletes in the London and southern region have got a facility and contact where they can get excellent support services.